I need to tell you before I start this post that this will be my last one. What! Yes, I am going away for my annual summer trip. This year I am going to Europe. I am taking my two wild munchkins to France, Belgium, Austria, and Germany. I will enjoy the train rides, the scenery, the castles, the museums, the people, and of course, the food. I have been so busy studying for this trip this past few weeks. I feel like if I have studied this much while I was in college in my youth(? ), I could have gotten the scholarship! LOL. Anyway I have done my homework and ready to hit the road with my two little ones without my piano man. Yes, just me and my 9 and 7 year olds. So, please pray for me that I can return in one piece, without going crazy…. 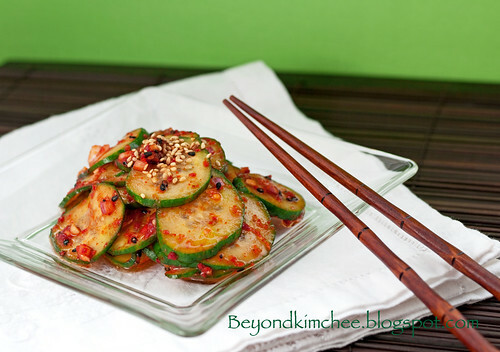 Today’s post is simple cucumber salad that is very popular among Koreans during summer time. I love this salad. It is spicy, slightly sweet, full of flavor, and most of all, it is a great side salad for dishes like Galbi or Bulgogi, or Dakguwi. I often serve this with grilled chicken in simple Asian marinade when I feel lazy that I don’t want to slave myself in the kitchen in hot summer days. This is a salad that you can put together within 10 minutes or less, seriously! No joking here! So let’s start. Set your timer to 10 minutes now! English cucumber, vinegar, plum extract(mashil jeup), shallot, garlic, Korean red chili flakes(gochugaru), black (or yellow) sesame seeds. And of course some salt and pepper, too. Slice cucumber thinly, about 1/8″ thick. If you have to use those American version with thick, waxy skin, peel off some of the skin. Korean cucumber is even better if you can find it. Her name is shallot. She is just a gorgeous girl next door! She only comes in petite size, just like me! Chop her into even smaller pieces. Chop your Mr. Garlic finer than usual. Because you will eat him raw! In a shallow bowl combine cucumbers with chili flakes, sugar, garlic, shallot, sesame seeds. Add couple pinches of salt and pepper. Add plum extract(mashil jeup) if you have. If you don’t, don’t worry about it. No big deal. and mix them well with your hands. You can toss with spoons, but “real Koreans” use hands when tossing vegetables. It helps the flavor to soak in cucumber. Gotta taste one slice to check for seasoning! You might need more salt. You can chill for 30 minutes before you serve. Done! Has it been 10 minutes yet? Cool, crunch, spicy, and full of flavor!That’s how you fight the hot summer days. Did I tell you that I will be staying at one of those fairy castles in Germany? And I shall be back in August. Slice the cucumber thinly, about 1/8" thick. Place them in a mixing bowl and add the rest of the ingredients, and mix well with hands until the cucumber slices gets incorporated with the dressing, about 30 seconds. Taste one piece of cucumber to see if it is sell seasoned. You might need to add more salt. Adjust seasoning for you liking. You can chill this salad in the fridge for 30 minutes before serving. If you let it sit too long the moisture in the cucumber will be extracted and the salad becomes too watery. Note: This salad will compliment nicely to Korean grilled meat such as Galbi, Bulgogi, or any Chicken dishes. « Thai Red Chicken Curry, Sawadtee Kaa! Ooh, this is one of my favorite salads at Korean restaurants--so glad to know how to make it at home! Please don't stay away from your blog for good! I thoroughly enjoy your blog and can't wait to see more of your delicious recipes, read your wonderful writing and enjoy every one of your posts! Have a wonderful trip and looking forward to your return in August! My mom always makes this and when I try to make it it never tastes right... Thanks for putting up the recipe! hope you and the little ones are having the best time ever!!! Hi! Can you help me with my finals in Asian Cuisne? I need to cook a fusion of Filipino and Korean food. Im thinking of doing this Spicy cucumber salad but my problem is I dont know what to put to make its taste for Filipino and Korean. Hope you can help me. Thank you. Honestly I am not so familiar with Filipino food, so I can't tell you how I can help. My advise is that you think of any Filipino dishes that can be fused with Korean condiments such as chili flakes or paste. But I believe Filipinos don't eat much spicy food unlike other SE Asians. This cucumber dish was just so gorgeous. With the addition of plum tea,( that I didn't know even existed) it gave the cucumbers such an exotic sweet taste... Highly recommended . I have to pass your blog onto my sister who lives in Singapore..she said there doesn't seem to be too much Korean food there?? and has to wait till she comes to visit back in Sydney... thanks again!! This is my favorite banchan, but every time I make it, the gochugaru has an unpleasant gritty texture. Do you have any tips on what I should do? Try with fine gochugaru. Some coarse flakes can be gritty. I put to much of spicy flakes what should i do? I you have more cucumbers, add more along with the other ingredients. Otherwise, there not much you can do. I can't find white vinegar in Miryang. Any substitutes? white vinegar is just the regular vinegar and any grocery store in Miryang should have it. If you can't find it, look for rice wine vinegar.